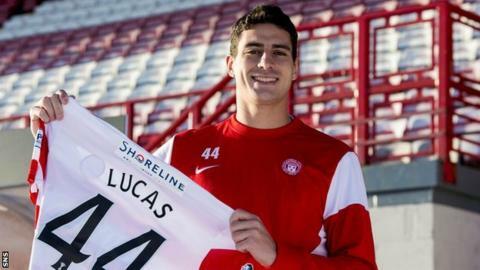 Brazilian defender Lucas Tagliapietra has joined Hamilton Academical after leaving Moldovan club Milsami Orhei. The 24-year-old has signed a one-year contract with the Scottish Premiership club. Accies are awaiting international clearance to play Tagliapietra, who holds an Italian passport. Tagliapietra began his professional career in Brazil with Inter Santa Maria before moving to then to a spell in Hong Kong. He left Sun Pegasus to head for Moldova, starting off with Dacia Chisinau before switching to top-flight rivals Milsami in 2013. Milsami presently sit second in the table, five points behind Dacia. Tagliapietra could be available for Saturday's trip to Dens Park to face Dundee.